I usually do not like to put anyone in the corner but today i will. It is often where we see posts on social media that violate copyrights and include false claims. Most often I choose to ignore them and every once in a while I decide to write a comment – just for the fun of it. My comment would be to challenge a claim by someone – so they try to debate or defend their post but once cornered, they pull the post in order for others not to see my comments. After they pull the post with my comments, it does not take long to re-post the same thing, obviously without my comments. You see if they pulled the post totally, I can give these people the benefit of the doubt that they recognized their mistake. However, when they re-post the same thing that means, at least to my simple mind, is that these people intend to mislead. Now since project management is my passion and my field for 30 years, I tend to write, blog, and take part in online discussions on project management, especially the PMP. When it comes to the PMP, obviously, PMI, the grantor of this certification has an ethical obligation to protect its leading certification. Unfortunately, PMI does not care as long as these organizations that are willing to lie bring PMI more members and PMPs. It is really a shame that PMI is not more involved in monitoring some of these organizations. Here is the specific situation that triggered this post. Of course there was more than the above but I chose to pick on the claim “Highest Success Rate” since it was listed in more than one place. The following image is self-explanatory – it is the discussion that went on. As I was writing my last response, the post was pulled from the page. SUKAD offers PMP training but not for the public in Saudi Arabia. 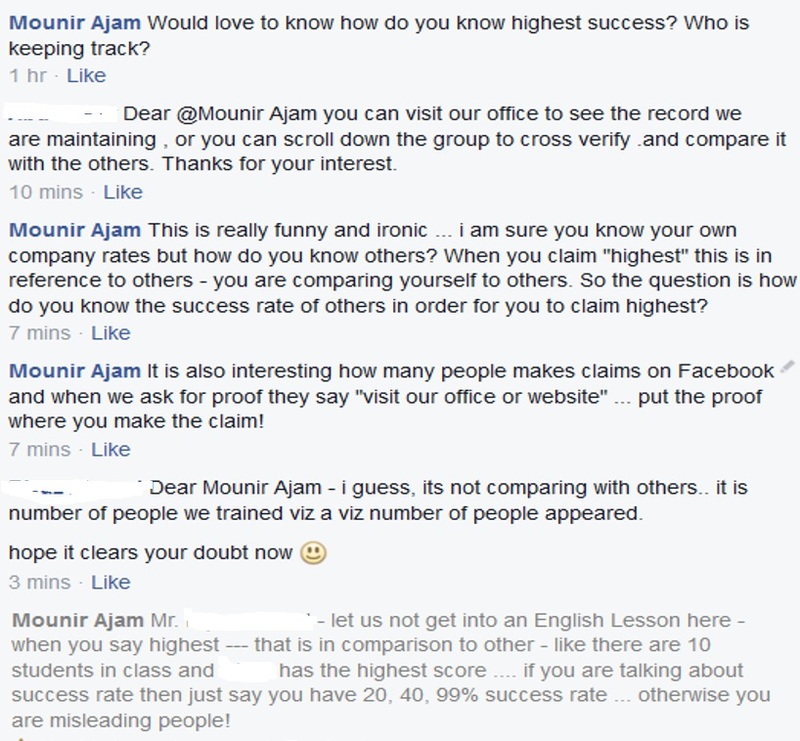 So the company posting is not a competitor to SUKAD and SUKAD or Mounir Ajam has no self-interest in this situation! This entry was posted in Ethics, Project Management and tagged Ethics, KSA, PMI, PMP, PMP Training. Bookmark the permalink. 2 Responses to Ethics in PMP training; does PMI cares?